Benazir Bhutto (Urdu: بینظیر بھٹو) (June 21, 1953 in Karachi – December 27, 2007 in Rawalpindi) was the youngest person and first woman to lead a post-colonial Muslim state. She was elected Prime Minister of Pakistan in 1988, only to be deposed 20 months later. During her first term, she founded the People's Program for the economic uplift of the masses. She also ended a ban on student and trade unions. Bhutto had a vision for a modern Pakistan. Her efforts to achieve this were hampered by political opponents and religious conservatives. Bhutto achieved the distinction of becoming the first female head of government of an Islamic state in modern times, pioneering the way for other Muslim women to follow in Turkey, Bangladesh and Indonesia. As the daughter of a political dynasty, she continued the work of her father, Zulfikar Ali Bhutto, to promote democratic policies. As a woman, her leadership brought significantly different qualities into play that could improve living standards for the Pakistani people. Yet her efforts to champion women's rights within an Islamic state also met with considerable opposition. Bhutto was re-elected in 1993 as Prime Minister following the resignation of President Ghulam Ishaq Khan and Prime Minister Nawaz Sharif, but was dismissed three years later amid various corruption scandals. Some of these scandals allegedly involved contracts awarded to Swiss companies during her regime over which she faced unresolved charges in Switzerland. Her husband, Asif Ali Zardari, spent eight years imprisoned until he was released in November 2004. As yet, none of the corruption charges have been proved in a court of law. Bhutto maintained the charges were politically motivated. Granted an amnesty by President Musharaf, Bhutto returned to Pakistan on October 18, 2007 to campaign for the promised General Election. She also started to coordinate opposition to the state of emergency that was declared on November 3. December 27, while leaving a rally in Rawalpindi, near Islamabad, she was killed (with 20 others) during a suicide attack. Bhutto played a positive role in championing women's freedom within Islam, and in the struggle for the democratization of Pakistan. Benazir Bhutto is the eldest child of deposed Pakistani premier Zulfikar Ali Bhutto (who was hanged by the Pakistan's military administration) and Begum Nusrat Bhutto, a former member of parliament and former deputy prime minister of Pakistan, who was of Kurdish-Iranian origin. Her paternal grandfather was Sir Shahnawaz Bhutto, an ethnic Sindhi. Bhutto attended Lady Jennings Nursery School and then the Convent of Jesus and Mary in Karachi. After two years of schooling at the Rawalpindi Presentation Convent, she was sent to the Jesus and Mary Convent at Murree. She passed her O-level examination at the age of 15. In April 1969, she was admitted to Harvard University's Radcliffe College. In June 1973, she graduated from Harvard with a degree in political science where she was elected to Phi Beta Kappa. She attended Oxford University in the autumn of 1973 and graduated with a master's degree in Philosophy, Politics and Economics. She was elected President of the prestigious Oxford Union, a position that many future British Prime Ministers held while students at Oxford. After completing university in 1977, Bhutto returned to Pakistan. This same year, martial law was declared and her father was arrested. In the course of her father's imprisonment and execution, she was placed under house arrest. Having been allowed in 1984 to go back to the United Kingdom, she became leader in exile of the Pakistan Peoples Party (PPP), her father's party. While in London she and her brothers established a movement to resist the military dictatorship in Pakistan. She was initially reluctant to enter politics but had a strong sense of personal destiny, and wanted to continue her father's work. Bhutto returned to Pakistan in April 1986 following the lifting of martial law. The response to her homecoming was tumultuous as she stirred up anti-Zia Ul Haq sentiment, publicly calling for his resignation. It was President Zia's government that was responsible for the death of her father. On November 16, 1988, in the first open election in more than a decade, Bhutto's PPP won the single largest bloc of seats in the National Assembly. She was sworn in as Prime Minister of a coalition government on December 2, becoming at age 35 the youngest person and also first woman to head the government of a Muslim-majority state in modern times. Many Muslim men objected to the election of a woman as Prime Minister on the grounds that Muhammad had said that whoever entrusts their affairs to women will not prosper (Bukhari, 9:88, Hadith 119). Others cited Qur'an 2:228, that men are a degree above women. Traditionally, women's participation in politics was considered forbidden. Bhutto's groundbreaking perspective also created resistance by conservative Muslims. Feminist Muslim scholar Fatima Mernissi and her colleagues opposed this conservative outlook at the time by undertaking a detailed analysis of Hadith 119. Her conclusion was that the interpretation was of doubtful authenticity and that Islam had no restriction on women holding public office. This contrast of belief and understanding certainly affected Bhutto's ability to lead and make progress on her agenda. During her first term, Bhutto ended a ban on unions. She was also heavily committed to getting electricity to rural areas and building schools throughout the country. Hunger, housing and health care were important to her. She envisioned a modern Pakistan. Unfortunately, her leadership and attempts to develop and modernize Pakistan were consistently resisted by the Islamic fundamentalist movement. After being dismissed under charges of corruption by the country's military supported President of Pakistan Ghulam Ishaq Khan, who used the Eighth Amendment to the Constitution of Pakistan to dissolve parliament and force an election, Bhutto's party lost the elections held in October 1990. She served as the leader of the opposition while Nawaz Sharif became Prime Minister for the next three years. In October 1993 elections were held again. The PPP coalition won, returning Bhutto to office until 1996, when once again her government was dismissed on corruption charges by then President Farooq Leghari, who also used the Eighth Amendment discretionary powers. Bhutto was charged and later cleared in a number of corruption cases in Pakistan. She was also charged with laundering state owned money in Swiss banks, in a case that remains before a Swiss court. It is alleged that Bhutto and her husband stole hundreds of millions of dollars by demanding 'commissions' on government contracts and other dealings. Between 1994 and 2004, the couple faced about 90 cases combined, none of which have been proved. Bhutto maintained that all the cases were politically motivated and she readily faced them. Her husband, Asif Ali Zardari, spent eight years in prison although he was never convicted. He was kept in solitary confinement and claims to have been tortured. Human rights groups also claim that Zardari's rights have been violated. Former prime minister Nawaz Sharif has since apologized for his involvement in the prolonged imprisonment of Zardari and the cases filed against Bhutto. This apology by Sharif gives credence to Bhutto's contention that the charges were politically motivated. Zardari was released in November 2004. During Bhutto's tenure, through complex political realities, Muhajirs (ethnically mixed group of immigrants to Pakistan) in Karachi continued to be victims of discrimination, violence and ethnic cleansing even though they represented approximately half the population of Karachi. There was belief among muhujirs, voiced by muhajir member of the Sindh assembly, Shoaib Bokhari, that the elite Sindh's including the Bhutto family, represented only 2 percent of the population but controlled 98 percent of the country. He also alleged that the federal government relied heavily on tax revenue from Karachi and its port but invested little in the commercial center in return. In 1995, a campaign of violence against muhajirs involving police and military occurred which culminated in two thousand deaths throughout Karachi. Most appeared to be politically motivated extrajudicial killings which were never investigated. There were many who felt that Bhutto did not do enough to stem the tide of ethnic and religious violence. However, this was not the worst of the violence against the muhajirs. Discrimination had been ongoing and violence had occurred in 1986 and peaked in 1992 with 18,000 muhajir killed. It was during Bhutto's rule that the Taliban gained prominence in Afghanistan. Bhutto and the Taliban were openly opposed to each other. According to Taliban codes, a woman had no right to be in power. At the Pakistan military's insistence, Bhutto agreed to provide some support. She and her government have said that they only provided moral support and nothing more. The Taliban took power in Kabul in September 1996. It has been suggested that Osama Bin Laden provided Nawaz Sharif with huge sums of money in order to 'buy support' and destabilize her government. During election campaigns, the Bhutto government voiced concerns over social issues of women, health and discrimination against women. Bhutto also announced plans to set up women's police stations, courts and women's development banks. Despite these promises, Bhutto did not propose any legislation to improve welfare services for women. During her election campaigns, Bhutto promised to repeal controversial laws (such as Hudood and Zina ordinances) that curtail rights and discriminate against women in Pakistan. During her two terms in power, her party did not fulfill these promises due to immense pressure from the opposition. However, her party did initiate legislation during General Musharraf's regime to repeal the Zina ordinance. These efforts were defeated by the right-wing religious parties that dominated the legislatures at the time. In 2002 Pakistan's president, Pervez Musharraf, who took power in a military coup d'état in October 1999, introduced a new amendment to Pakistan's constitution which bans prime ministers from serving more than two terms, disqualifying Bhutto from holding the office again. Some said it was largely implemented because Musharraf's desire is to exclude previous leaders from future politics. Bhutto had been sharply critical of Musharraf's government and participated in anti-government campaigns. She resided in Dubai, United Arab Emirates, in exile with her children and her mother. From there, she traveled globally, giving lectures and keeping in touch with the Pakistan Peoples Party's supporters. 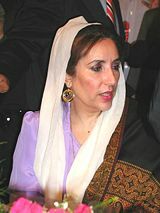 Benazir Bhutto and her three children (Bilawal, Bakhtawar and Asifa) were reunited with her husband and their father in December 2004 after a separation of more than five years. Bhutto's election as Prime Minister of Pakistan paved the way for other Muslim women to aspire to lead their countries. Subsequently, Turkey, Bangladesh and Indonesia have had women leaders. Bhutto was an observant Muslim but supported a secular political system similar to that originally envisioned for Pakistan by its founder, Muhammad Jinnah, in which Islam would provide the moral values and inform legislation but religious liberty would be protected. Bhutto was a popular politician who despite her own privileged background wanted to make Pakistan a more egalitarian society. It was probably her opposition to the power of the elite, including the military, that resulted in charges of corruption. Her policies also annoyed those who demanded that Pakistan become more Islamic, which, in their understanding, required the imposition of ninth century legal codes and the confining of women to the domestic sphere. Her determination to campaign in 2007 when she knew that her life was in danger, testifies to her courage and commitment to the democratic process. ↑ "Benazir Bhutto Killed in Attack," BBC News, December 27, 2007 Benazir Bhutto Killed in Attack BBC News. Retrieved December 28, 2007. Butto, Benazir. Foreign Policy in Perspective, Lahore: Classic, 1978. Butto, Benazir. The way out: Interviews, impressions, statements, and messages. Karachi: Mahmood Publications, 1988. Butto, Benazir. Daughter of Destiny. NY: Simon & Schuster, 1989. ISBN 0671669834. Butto, Benazir. Benazir Bhutto defends herself. Lahore: Rhotas Books, 1990. Butto, Benazir. Issues in Pakistan. Lahore: Jang Publishers, 1993. Bhutto cleared of corruption BBC News. Pakistani police deploy in force, shut Lahore CNN online. This page was last modified on 1 June 2016, at 20:22.